While U.S. banks reported a whopping $59 billion in bad-loan charge-offs in the fourth quarter of 2009, research firm Audit Integrity believes they conveniently ignored another $3 – $4 dollars of further loan losses for every dollar loss they reported. 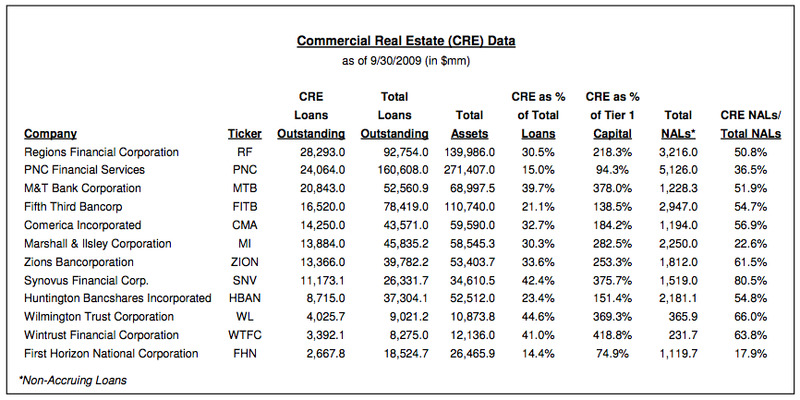 That’s because most of the $59 billion reported came from losses on home loans, not commercial real estate. Yet nearly 3,000 commercial banks are classified as having a high commercial real estate concentration according to the Congressional Oversight Panel, and AI believes that there’s a lot of commercial real estate loans out there which are in trouble. So why so few losses reported? 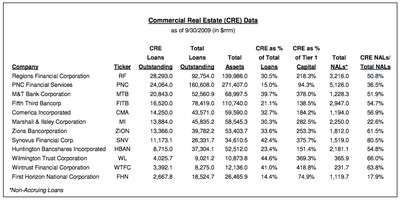 I refer to our recent INSIGHT, “Financial Institutions and Commercial Real Estate Risk” (attached), that directly addresses the reality of “Extend and Pretend.” Commercial banks hold over $1.7 trillion of commercial real estate, and are reluctant to write down their holdings. In fact, FASB has changed its interpretation of FAS 115-2 and FAS 124-2, making it extremely easy to avoid recognising loss in value. A charge-off rate that more accurately reflects commercial real estate values would drive banks into a substantial negative earnings position. A selection of banks who AI suspects are representative of the problem is shown below. The firm believes that if banks had been forced to report a more realistic amount of charge-offs, many would have shown negative earnings in Q4. Thus you probably want to be extra sceptical of any banks with high commercial real estate exposure when it comes to their earnings or Tier 1 capital. These financial numbers probably don’t mean much right now, and won’t until we see the full extent of how loan losses play out. Some could even be insolvent already, if forced to show the real value of their portfolios. So try and pick out the zombie banks from the table above. Good luck.